We just can’t get enough of the sweet summer watermelon. It’s delicious pureed in a chilled soup, and what we love even more is enjoying it frozen. Popsicles are all the rage right now in this steamy August heat. Frozen pops are a simple way to use up several cups of watermelon the next time you crack open one of the giant fruits. Thanks to Everyday Food Magazine for this delicious recipe from an issue last summer. Try using frozen strawberries when you make the Watermelon-Strawberry Pops. They’re already hulled, which simplifies the recipe. All you have to do is thaw a couple cups of berries in the fridge before putting them in the blender. Add several cups of watermelon, ½ cup sugar, a few tablespoons of lime juice and there’s a healthy treat to enjoy anytime! No ice pop molds on hand? Just pour the puree into a freezer-safe container, such as a metal pan, and scrape away at the frozen mass to make a tasty shaved ice treat. Even more than summer fruit, we enjoy keeping all of our digits, so after a couple of close calls with the knife, Stacey started using a melon baller to get the fruit out of the rind. And here’s another tip: It’s a travesty to dump the juice that collects as you dig into the fruit, so freeze it in ice cube trays and then add the cubes to a glass of cold water. For easier pouring, make sure you put the juice into a cup with a spout and then pour into the trays. Try various types of fruit juices to create flavorful ice cubes. In case you missed National Watermelon Day on Tuesday (8/3), we searched the food blogosphere for some other creative, refreshing watermelon treats to help you celebrate. 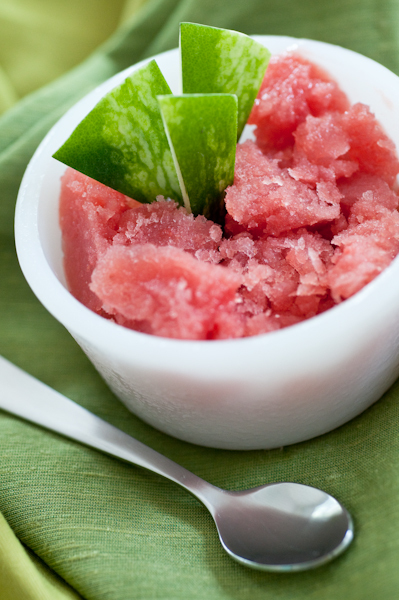 Cooling off with watermelon lemonade, or this watermelon sorbet sounds like an excellent idea. Two great fruit and cheese pairing ideas: feta and watermelon or mango and blue cheese and watermelon. Yum! And find a sweet and hot mix in this salsa. If you’re having trouble carrying your watermelon home from the farm market or store, help is on the way (for a small price). Enjoy some great watermelon treats, and feel free to share your ideas with us, too. We want to know: What do you do with the rind? Toss it out? Pickle it? these watermelon things sound awesome…and with all this heat they are a perfect treat ….even for 8 month old lileigh grace! great job stacey…and the photo is making me really hungry! everyfoodfits.com » FREE August Cooking Classes with Kiss the Cook!